There is nothing quite like sipping on an ice cold bottle of your favorite beer, when you are simply chilling out by the pool or on the verandah in peace and quiet, while your loved ones are all around. Life is complete and beautiful then, isn’t it? 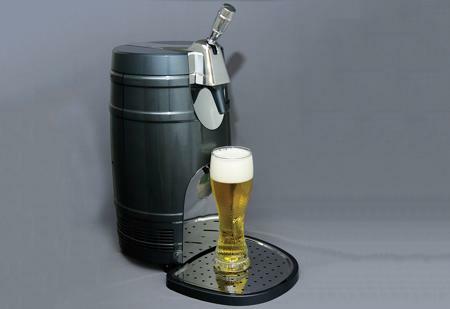 Since we are all creatures who always feel as though there is always “more” on the horizon, perhaps that earlier picture as described would not be complete without the $199.99 Mini Keg Cooler with Tap? Yes sir, the idea of getting one of these might prove to be extremely enticing, since a full-sized keg happens to be far too large for your next party or cookout, so why not just use a 5-liter keg and place it in the handy Mini Keg Cooler with Tap instead? The Mini Keg Cooler with Tap will boast of state-of-the-art thermoelectric cooling technology, ensuring that it works just fine, ensuring your drinks within remain ice cold at all times without creating a racket, and neither does it vibrate until you feel that there is a tremor in your surroundings due to a faraway earthquake. This cooler has also been certified to be environmentally friendly and CFC free, and it can be plugged into an AC outlet or better yet – the cigarette lighter of your car. Just don’t drink and drive, but your passengers sure will have a smashing good time!